Last week’s Crocodile showed a detail of a cancelled name on the title page of Folger STC 17132. Title page of Folger STC 17132 with Humphrey Dyson’s name deleted. Despite the parallel hatching that was used to conceal it, two Collation readers immediately identified Humphrey Dyson’s distinctive signature. The item note in the Hamnet record describes it as “inscription on t.p. crossed out and illegible,” but watch this space—Folger catalogers will soon update the record to reflect the fact that An answer to the vntruthes : published and printed in Spaine, in glorie of their supposed victorie atchieued against our English Nauie… (London: John Jackson for Thomas Cadman, 1589) was once part of Dyson’s library of 2,000 titles and roughly 6,000 broadsides. It turns out that Humphrey Dyson is a repeat victim of erasure. His name has been deleted in six out of the twenty-nine volumes at the Folger that were part of his library. Humphrey Dyson’s name deleted using a vertical parallel hatching technique. Both of these books concern the Spanish Armada and were printed in 1589. In addition to the Dyson provenance, they also belonged to the Mostyn family and came to the Folger as part of the Harmsworth collection. Humphrey Dyson’s name deleted using a slanted parallel hatching technique. 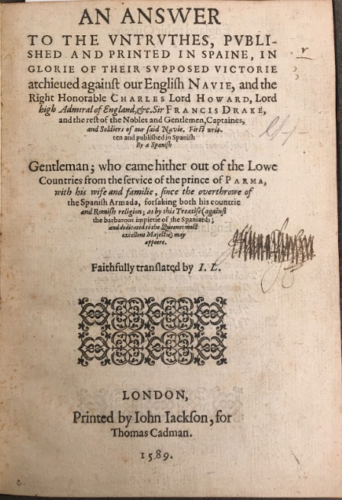 Both books were printed in 1589 and in addition to the Dyson provenance, they also belonged to the Mostyn family and came to the Folger as part of the Harmsworth collection. Humphrey Dyson’s name deleted using a ovular scribble (left) on a book printed in 1588 and a straight line plus hatching plus otiose ascenders and descenders (right) on a book printed in 1528. After his death in 1633, Dyson’s books went to Richard Smith, and were then sold at auction seven years after Smith’s death, in 1682. One could surmise that Smith inconsistently made these deletions when he acquired the collection, but the style of cancellation is different enough in the Folger examples to suggest that the deletions happened under a variety of circumstances, some perhaps in the years after the collection was dispersed in 1682. Prof. Alan Nelson has located 440 books (plus many broadsides) from Dyson’s library so far, or about 20% of the known titles. In about 50 of these 440 titles (about 10%), Dyson’s name has been crossed out. How did 10% of his surviving books end up with his name cancelled? The next step would be to look at Dyson cancels at Oxford, Cambridge, the Huntington, and elsewhere to see if the deletion styles can be grouped as the Folger ones above. If you spend a lot of time looking at title pages of early modern English books, like many of us do at the Folger, you start to notice that Humphrey Dyson is not alone. Most early modern owners of early modern books were not famous or offensive enough to fall victim to the equivalent of today’s cancel culture, and yet, for some reason, their identities have been obliterated by their near contemporaries. The Folger curatorial team—Caroline Duroselle-Melish, Beth DeBold, and myself—are trying to figure out why. The project so far has consisted of gathering the data in one place, and the next step will be to process it more methodically, with the theory that a data-driven approach to categorizing and understanding different types of obliteration will enhance our understanding of book ownership and the used book trade. The Folger copy notes don’t specify whether the name or deletion is early modern or much later, so we had to make some judgment calls in the STC vault with phone cameras in hand. We excluded deletions of later inscriptions and later deletions of early modern inscriptions (by 19th century bookbinders and book dealers, for example, who engaged in bleaching and washing of names). These are very ripe fields of inquiry, but not for understanding early modern book ownership. We now have a spreadsheet of about 250 volumes with cancelled ownership marks. This is about 1.4% of all of the STC books we have in our vault (about 18,500 volumes). Of these 250 titles, we’ve imaged about 80 of them. We have added a partial list to Folgerpedia (which already needs updating) to serve as a preliminary finding aid. What are the different techniques that obliterators use? Is the name completely illegible, partially legible, or perfectly legible to the naked eye? If we are able to recover names and identify them, can we categorize the types of owners (by gender, social status, religion, etc.)? If we categorize by format or genre of book, are certain types of books more likely to have a deleted chain of ownership? The “wet” method: cancellation by wetting and smearing. The “dry” method: cancellation by scraping with a penknife or dry quill? The pen-based method: two parallel striking lines. Who would ever cancel Gabriel Harvey, especially in a presentation copy of a book written by his brother? The pen-based method: deletion by looping. An attempt to totally obscure a name. Looking at heavily obliterated names is daunting, frustrating, tantalizing, and sometimes absolutely rewarding. One can often make out a few letters, or see that a name was written in a strong italic aristocratic hand, or that it looks like a woman’s name. So far we have only used a couple of simple techniques and tools that are readily and inexpensively available online or in many special collections reading rooms. While more expensive and time-consuming techniques such as multi-spectral imaging could provide results, we’ve discovered from experience that pictures taken with a phone camera uploaded to tools like RetroReveal or free image viewers that have options for grayscale or different color channels, are nearly as useful. Also, images taken with a flexible light pad placed underneath the obliterated name can help you to see it better, and in some cases, a black light flashlight, which emits longwave ultraviolet light (UV-A) while blocking out visible light. What can we do at the Folger to un-cancel these cancelled names and/or make them more discoverable in Hamnet, so that researchers can pursue individual names or delve into this new world of “inscription cancellation studies”? The curators and catalogers are having a summit meeting in a few days to discuss various possibilities, which may include: 1) creating a standardized vocabulary for consistently describing the specific type of provenance obliteration in the Notes section for each instance; 2) adding authorized name headings and relator terms for the names that we (or you, our readers!) are able to decipher; 3) proposing new terms to the RBMS controlled vocabularies, so that all instances of this particular type of marking can be found with a single click. This is not only an exercise in trying to erase erasure and add names back into the chain of provenance. Recovering a name is just a small part of the puzzle, which can only be completed when we understand why it was deleted in the first place. A recovered name needs context and interpretation. It must be read against a book’s other/earlier/later ownership marks and inscriptions, its marginalia, binding, and subject matter, and against other books with similar techniques for cancellation. In what way are these deletions similar to or different from other forms of textual correction and deletion? Why not use pasted-in slips to cover names, instead of messy scraping or blotting or looping? It seems obvious that some people are simply signalling the change in ownership in the most basic way possible. But might previous owners be cancelled because the current owners were lending and sharing their books, and wanted to make sure they were returned to the current owner? Can we distinguish between professional erasers and amateur erasers, or books that personally changed hands or changed hands through the trade in used books? Why would someone go so far as to deface a title page in order to hide the identity of a previous owner? We hope by drawing attention to the cancelled names in our own collection, we can augment and contribute to the work that has already been done by Penn’s Provenance Online Project, curated by Laura Aydelotte and the latest edition of David Pearson’s Provenance Research in Book History (2019). Notes: I am grateful to Professor Alan Nelson for sharing his work on the library of Humphrey Dyson. I presented a version of this post at the annual meeting of the Renaissance Society of America in Toronto in March 2019. Heather Wolfe is Curator of Manuscripts at the Folger Shakespeare Library, and teaches early modern English paleography for the Folger Institute and Rare Book School. What a fascinating article, Heather – thank you so much for posting this. One silly question, though: you mention that later removals of names aren’t of interest to you, but how do you actually tell those apart from early modern cancellations? 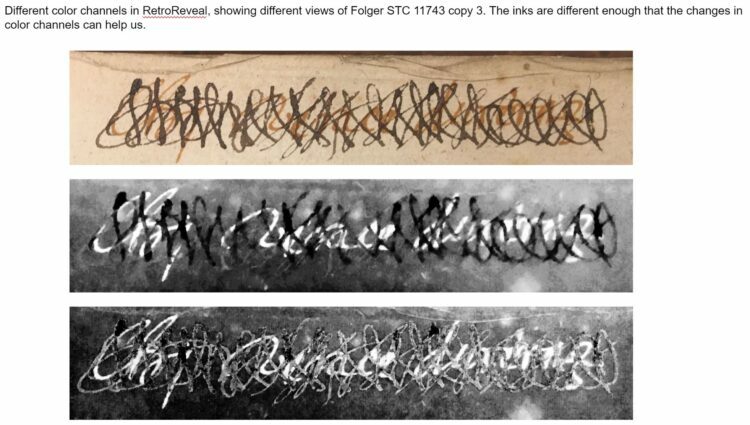 Is it really possible to identify, say, late 18th-century ink or pen-scrapings on sight? Or did later owners always use different obliteration techniques, i.e. bleach etc? (Maybe this is a wrong assumption on my part, but I always thought that people used pens and ink made by much the same methods even into the 19th century, so if the didn’t actually *write* anything that would allow you to date the handwriting, it might be difficult to tell the age of any hatching or looping done by them). The summit has happened! 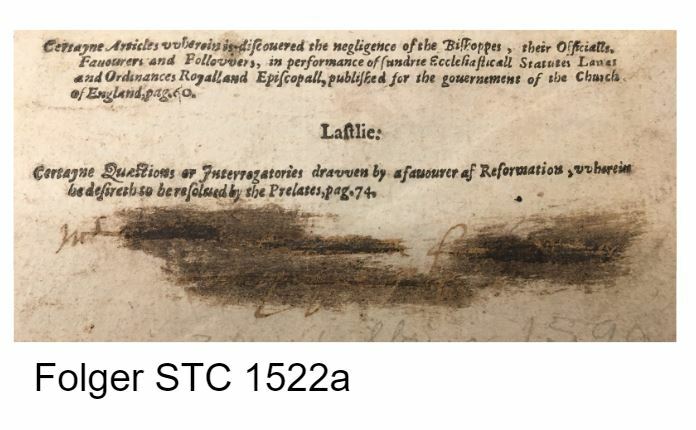 Folger catalogers will add “Cancelled ownership marks” to records for items that contain any evidence of ownership cancellation, whether the name is legible or illegible, and are free to use whatever general language in the copy note that best describes the cancellation. As of now, there is one record in Hamnet proudly bearing this genre/form term, _Answer to the vntruthes published and printed in Spaine_, mentioned by Heather above: . We will, eventually, add this term retrospectively, and propose the term for inclusion in the RBMS Controlled Vocabularies. Good point. It would be more responsible for us to say that we are focusing on cancels that appear to have been made with iron gall ink, and that predate the washing/bleaching era of collecting. This could potentially extend well into the eighteenth century.